Reiner Knizia’s Medici HD for the iPad is a unique turn-based board game experience from the renowned German game designer. 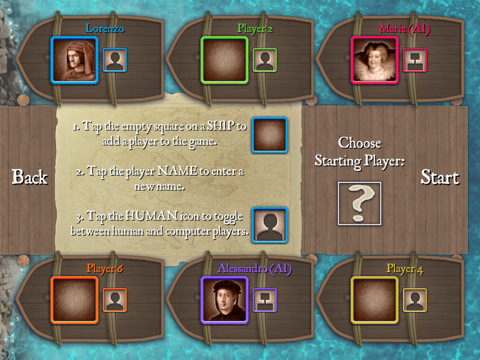 Medici is playable for up to six players on one iPad. The app is based on the House of Medici family that rose to prominence during the Renaissance. If you’re familiar with other Knizia games, such as Money or Ra, you won’t be disappointed with this offering from Codito Development Inc. 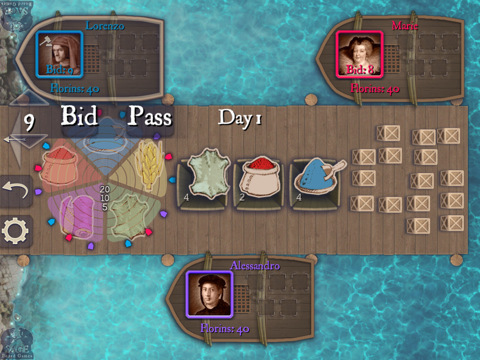 The game pits you against up to five other members of the Medici family in a three-day (round) bidding competition in an effort to see who can make the most money. Players choose crates on the dock to open and each player gets to place one bid on the lot up for auction. At the end of the auction, the player with the highest bid wins the lot, though each player can only win five crates per day. At the end of each round, each player is paid for their haul based on the total number of each commodity, and the total of all their commodities combined. After three days, the player with the most money wins the game. Knizia is known for his unique, thought-provoking board games and this is no exception. As with any Knizia game, it takes playing the game through a few times to get a firm grasp on the rules, though the game does have a detailed (if not occasionally confusing) set of instructions included. It takes a great deal of strategy, and a little bit of luck, to be able to consistently win at this game. Medici is a great title to be able to play with up to five of your friends, and it supports both a table-top mode as well as pass-and-play, though both only in landscape. While the background music evokes thoughts of the Renaissance period, it can quickly become repetitive. Thankfully, the folks at Codito Development included the option to play your own music and playlists from the iPod app. Medici’s graphics are colorful and vibrant and make the game pleasing to view, though there is little movement during the game which gives it a true board game feel, but some might find that aspect a little dull. As great as Medici HD is, there are a few drawbacks. Online multiplayer is noticeably absent even though this format cries to be played against others. While the strong AI is an acceptable substitute for human competition, it’s a shame that this game is not compatible with Game Center, nor are there any achievements to work towards in single-player mode. However, Medici doesn’t lose anything by lacking these features, though they would be a welcome addition. Medici HD for iPad is available on the App Store for $2.99, and is a great value for those looking for a 15-20 minute board game to play with friends, or a 5-10 minute game to play alone. If you’re looking for a fun strategy board game, Medici HD is not one to pass up. AppSafari review of Reiner Knizia’s Medici HD was written by Alex Seiver on June 21st, 2011 and categorized under App Store, Board, Featured, Fun, Games, Strategy. Page viewed 3607 times, 2 so far today. Need help on using these apps? Please read the Help Page.